Zion Market Research has published a new report titled “Heart Pump Device Market by Product (Ventricular Assist Devices, Intra-Aortic Balloon Pumps, and Total Artificial Heart),by Type (Implantable Heart Pump Devices and Extracorporeal Heart Pump Devices), and by Therapy (Bridge-To-Candidacy (BTC), Bridge-To-Transplant (BTT), Destination Therapy (DT), and Other Therapies): Global Industry Perspective, Comprehensive Analysis, and Forecast, 2018 - 2024”. According to the report, the global heart pump device market was valued at approximately USD 1,648 million in 2017 and is forecast to generate revenue of around USD 5,497 million by the end of 2024, growing at a CAGR of around 18.8% between 2018 and 2024. Heart pump devices are used to support heart functioning and blood flow, particularly for those who are suffering from heart-related issues. They are electromechanical devices assisting cardiac circulations and are partially or completely used for replacing the function of a failing heart. Increasing incidences of cardiovascular diseases are triggering the expansion of the heart pump device market worldwide. Cardiovascular diseases are among the top causes of death worldwide, according to the World Health Organization. The global market for heart pump device is classified in terms of product, therapy, type, and geography. By product, the heart pump device market is divided into intra-aortic balloon pumps, ventricular assist devices, and total artificial heart. Ventricular assist devices segment is further sub-segmented into bi-ventricular assist devices, right ventricular assist devices, left ventricular assist devices, and percutaneous ventricular assist devices. Ventricular assist devices segment contributed substantial revenue to the global heart pump device market in the year 2017 and is expected to record significant growth over the coming years. This is due to the increasing prevalence of heart failure. The left ventricular assist devices sub-segment is expected to account for the highest share in heart pump devices market in the upcoming years. By type, the market for heart pump device is bifurcated into extracorporeal heart pump devices and implantable heart pump devices. Implantable heart pump devices segment contributed substantial market share in the year 2017 and is slated to record a remarkable growth in the forecast span. This market is driven by the higher success rate of products, enhanced technology, and improved efficiency. Increasing safety in the implantation process of implantable heart pump devices is anticipated to fuel the market growth and will contribute significantly toward this segment share in the global heart pump device market. By therapy, the heart pump device market is divided into Bridge-To-Candidacy (BTC), Bridge-To-Transplant (BTT), Destination Therapy (DT), and other therapies. The Bridge-To-Candidacy (BTC)is likely to contribute a significant share in the global heart pump device market. This segment is anticipated to record the highest CAGR in the forecast span, owing to effective patient outcomes and better results. North America, AsiaPacific, Europe, Latin America, and the Middle East and Africa are the key regional segments of the global heart pump device market. North America dominated the global heart pump device market in the year 2017 in terms of revenue. The high adoption rates of products developed healthcare facilities, and the adoption of new technologies in the region is likely to boost this market’s growth during the forecast period. Europe is projected to be the second largest market for heart pump device across the globe. 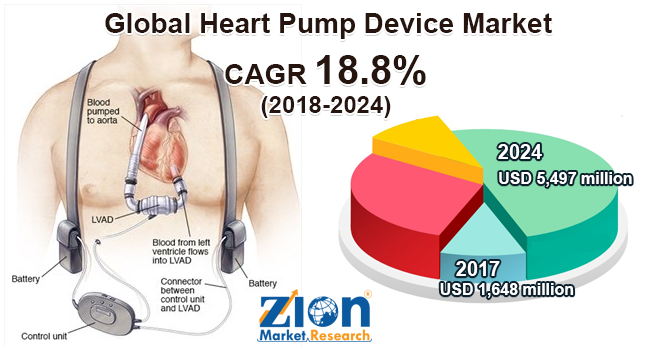 High prevalence of cardiovascular disorders, rapidly developing healthcare infrastructure, and an increase in the adoption of heart pump devices in the Asia Pacific region is likely to propel the growth of heart pump device market in the region, which is anticipated to register the highest CAGR in the forecast timeframe. Some key players of the heart pump device market include Abbott Laboratories, SynCardia Systems, Fresenius Medical Care, Abiomed, Medtronic, Jarvik Heart, Getinge, Teleflex, Reliantheart, Terumo, Berlin Heart, and CardiacAssist.